This evening the Universal Peace Federation held a charity concert at St Stephen’s Church Hall in south London in aid of ‘Palestinian Youth for Non-Violent Democracy’ and the Bishop of Jerusalem’s charities for traumatised children in Palestine, Haifa and Lebanon. 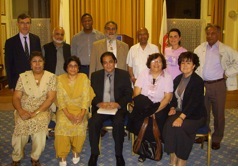 This evening the Universal Peace Federation in London held a recital of Urdu poetry by Ahmed Omer Shareef, a celebrated poet from Pakistan who is currently visiting the United Kingdom. He was introduced by an Ambassador for Peace, Cllr. Faizullah Khan who then acted as translator for the evening. Ahmed Shareef, has been in the literary world for more than half a century and also writes drama, for radio and TV. 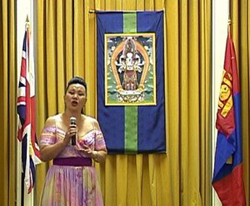 This evening the Universal Peace Federation in London played host to a performance of classical and uniquely Mongolian opera sung by international opera soprano, Mrs Ayurzama Dolgor, to celebrate the 800th year of Mongolian statehood. Regarded as the Mongolian People's Honourable Artist and a messenger of peace, she drew an enthusiastic response from the audience. His Excellency the Ambassador to Mongolia, Mr Dalrain Davaasambuu, explained the significance of the 800 years of Mongolian statehood. He also praised the role played by the United Kingdom in opening economic relations between Mongolia and the European Union. Mr John Grogan MP, Chair of the All Party Parliamentary Committee for Mongolia, spoke of the wonderful celebration he had experienced in the country earlier in the year.